International Journal of Research in Health Sciences,2014,2,3,812-817. 1- Associate Professor, Department of Chest and TB. 2- Assistant Professor, Department of Medicine. 3- Assistant Professor, Department of Chest and TB. 4-Professor, Department of Cardiology. 5-Junior Resident, Department of Chest and TB, Gandhi Medical College, Bhopal, Madhya Pradesh, INDIA. Objective: To confirm various cardiovascular manifestations in Chronic Obstructive Pulmonary Disease (COPD) patients and to observe correlation with its severity. Methodology: This prospective cross sectional study conducted at Department of TB & Chest Diseases, Hamidia Hospital, Gandhi Medical College, Bhopal between March 2008 to Dec 2013. Patient having diagnosed COPD were subjected to this study. Purpose of study was explained and informed consent was obtained. Results: Total 37% (n=74) males and 4% (n=8) females were found to have cardiovascular complications in the study group. Cardiovascular manifestations were most commonly observed in very severe stage of COPD, which were 54 out of 76 (71.05%). In mild cases no patient was diagnosed with cardiovascular manifestations, moderate 4 out of 38 (10.5%) and severe disease stage 24 patients out of 62 (38.7%). Majority of the patients= 97(48.5%) were in the age group of 60-70 years, out of which 41(20.5%) were having cardiovascular complications. Likewise, 28(14%) out of 74 (37%) patients were having cardiovascular complication in the age group of 50-60 years and 13(6.5%) out of total 29(14.5%) were with cardiovascular complication in 40-50 years. Conclusion: Stage of COPD is proportional to prevalence and severity of Pulmonary artery hypertension (PAH). 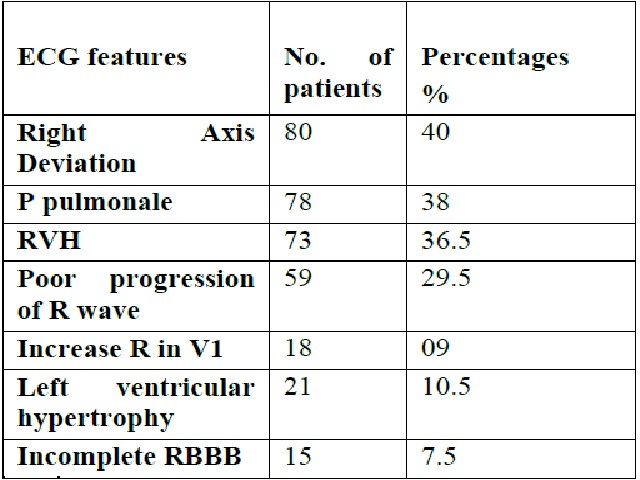 Electrocardiogram (ECG) can be used for screening of COPD with most common parameters observed may be Right axis deviation, P pulmonale, and Right Ventricular Hypertrophy. 2D-Echocardiography (ECHO) may be better modality for detection of Left Ventricular dysfunction. Most common complication detected in ECHO is PAH. Duration of smoking (smoking index) increases the incidence of Cardiovascular manifestations. ECG and ECHO being noninvasive and easily available, can be routinely recommended for COPD patients.